Congratulations are in order for students Joshua Day, Kayla Fisher and Scott Pegelow who, along with their faculty advisor, Balamurugan Pandiyan, received first place in presentation and second place for their written summary at the Wisconsin Mathematical Modeling Challenge at UW-LaCrosse last weekend. 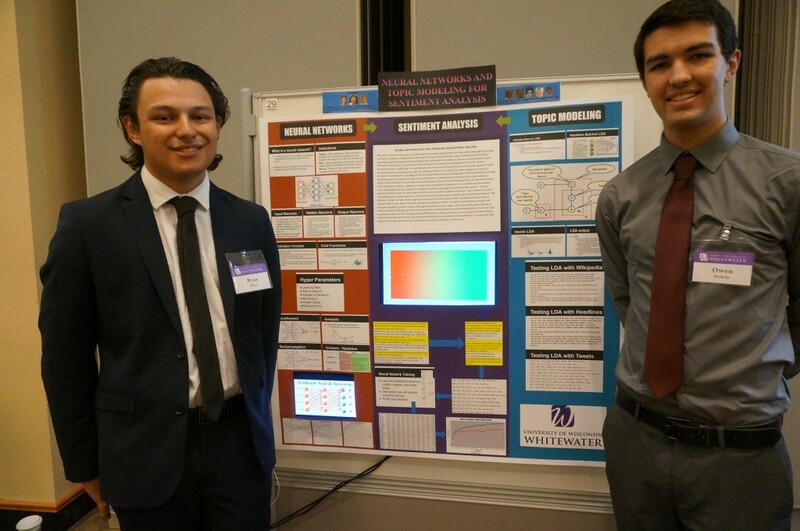 Josh and Scott currently work on a research grant for the US Navy with Professor Hien Nguyen. Hiring December and May grads and Summer Interns. 10/5/15 Performance Gateway in Madison hiring December 2015 and May 2016 grads for Associate Software Engineer positions. More information? Visit their website. If you’re looking for a full-time entry level job or an internship, you should attend the Hawk Career_Fair.